Robert Joseph LeBlanc was born in Vermilion Parish in 1921. He graduated from Abbeville High School in 1938 lettering in Boxing, Swimming and Football. He then graduated from LSU in 1942 majoring in Geology and Mathematics. He was called to active duty in 1942 and served as Platoon Leader and Company Commander in the Infantry Basic Training Center at Fort McClellan, Alabama. In 1943, he volunteered for duty with the Office of Strategic Services. He then served in the 3rd U.S. Army, Headquarters, SO, Special Forces Detachment #11 as a Special Operations liaison officer between Patton's Army and the French Underground. He also served with the VIII and XII Corp as well as with the Fourth Army Division attached to the United States Third Army in France. In 1944, he was transferred to the China-Burma Theater where he served as a Special Operations Officer with the OSS Detachment, Kunning, China. After WWII, General LeBlanc joined the Louisiana National Guard and organized Company H, 156th Infantry in Abbeville. In 1959 he became Brigade Executive Officer. He was promoted to Colonel in 1960, at which time he became Deputy Brigade Commander of the 39th Infantry Division. In this position he was instrumental in the location of a Battle Group Headquarters which later became Battalion Headquarters in Abbeville and a Brigade Headquarters for Lafayette. In 1963, upon reorganization of the Division, he assumed command of the 1st Brigade, 39th Infantry Division. In 1967, he assumed command of Emergency Operations headquarters, Louisiana Army National Guard and was promoted to Brigadier General of the Line. 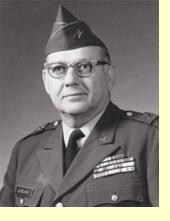 In 1972, LeBlanc was assigned as Director, Emergency Operations and Commanding General, Louisiana Army National Guard Command, New Orleans, Louisiana. Upon military discharge he trained in Dallas at the Southwest Photo Institute and opened LeBlanc's Photo Studio in Abbeville. While also employed as a rural carrier for the U.S. Post Office, LeBlanc was promoted to Postmaster of Abbeville. In 1972, he was promoted to Sectional Center Manager/Postmaster for Lafayette where he supervised 93 post offices in southwest Louisiana. It was through his leadership that he planned the new postal facility on Moss Street. He then documented the need for post offices that became Energy Station in the Oil Center, the Postal Square Station downtown and the new Ambassador Caffery Station. While Sectional Center Manager/Postmaster, he swore in more postmasters than any other SCF Manager. After Hurricane Audrey, LeBlanc was asked to take over the operations of the Civil Defense Office to restore damages to Vermilion Parish. He was instrumental in the reconstruction of Pecan Island, Forked Island and the Henry-Boston area. Six months later he returned to the post office and remained a Part Time Director of Office of Emergency Preparedness, handling a number of hurricanes and emergencies for the State of Louisiana and Vermilion Parish. His Parish Emergency Operations Plan and Implementation was used as a model for the State of Louisiana. In March of 1969, LeBlanc made history by successfully commanding troops of the 1st Brigade, 39th Division, LANG, in the famous Bogalusa Civil Disturbance, by protecting marchers from serious injury. This military effort made national news at the time.